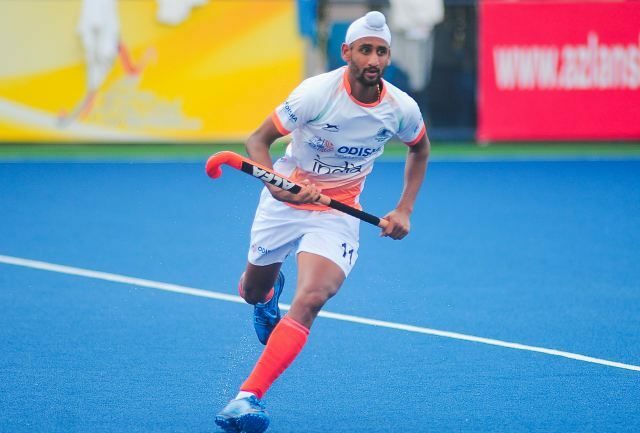 Mandeep Singh scored the sole goal for India as India couldn’t edge past Korea in their second match of Sultan Azlan Shah Cup 2019. 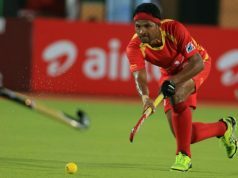 Indian Men’s Hockey Team faltered in the final minute to draw the match 1-1 against Korea here at the 28th Sultan Azlan Shah Cup 2019 on Sunday. They immediately launched a counter attack, entering India’s circle but defender Surender Kumar tackled well to clear the ball. The intensity with which both teams began play ensured that this was going to be an exciting game with the two teams pushing each other hooter-to-hooter. India made two more potential field goal scoring opportunities but the efforts did not convert. A quick-thinking Mandeep Singh created India’s first PC around the 10th minute with good tackle in the baseline. The opportunity however went amiss due to poor execution ending the first quarter in a stalemate. India won their second PC in the initial minutes of the second quarter but the flick was well-saved by the Korean goalkeeper. The following minutes saw Korea execute the full-press to limit India’s circle entries. Though the tactic was good, they lost three players (Kim Hyeongjin, Jihun Yang and Lee Namyong) to green cards that reduced their strength to eight players. 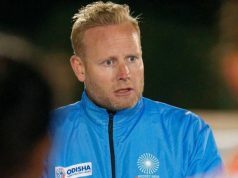 The situation was capitalized by India as they found easy gaps to make circle entry and experienced Mandeep Singh striking the first goal for India in the 28th minute. 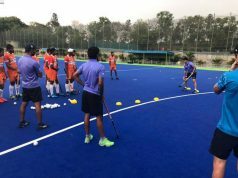 India kept up a good structure, relied on strong defense with precise marking as they constantly pushed the Korean defense to make forays into the striking circle. Playing in rain after the third quarter began, a defence error on India’s part saw Korea being awarded their first PC of the match. But India’s forward Amit Rohidas did well to ward off danger and ensure India stayed in the lead. Braving the rain, both teams played on par with each other. With a little over eight minutes remaining for the final hooter, the game was called off due to heavy rains. On assuming play, Korea put forth an attacking front to win back-to-back PCs but didn’t find success. With 53 seconds remaining, Korea won a PC but Jonghyun Jang’s powerful dragflick was brilliantly saved by India goalkeeper PR Sreejesh. A referral by Korea saw them being awarded another PC. This time it was converted resulting in a 1-1 draw. On 26 March 2019, India will take on Malaysia at 18.05 hours IST.